Learn about our Give a Smile, Get a Smile promise. 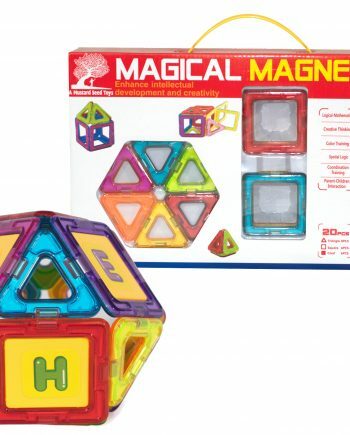 This 40 piece set of magnetic blocks comes with an excellent range of shapes and accessories to get started. Check out our magnetic building sets on Amazon too. We decided to purchase these magnetic tiles after our 3-year old son had fun playing with a set at daycare. This set came with 40 pieces, which included a set of two wheels. The wheels were a big hit with our son. 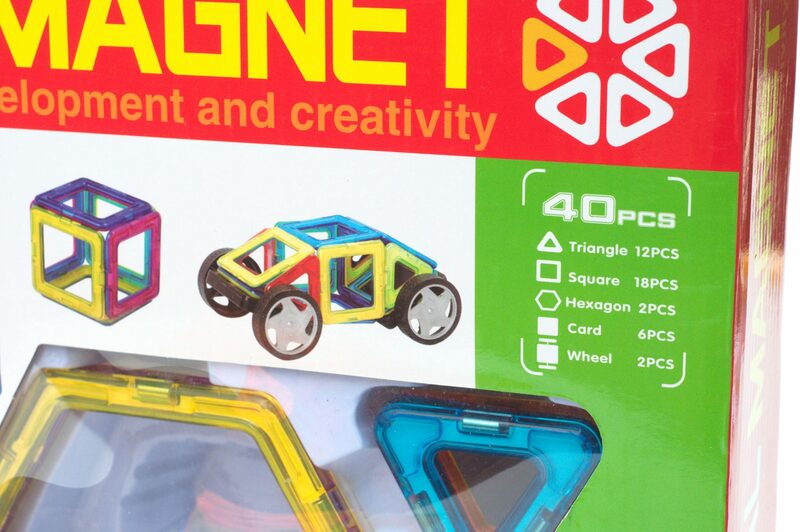 The magnet shapes have two different colors on each side and represent the actual colors shown on the box. The outside of the box shows 12 assemblies that can be made using this set, and we have made all 12. The kit also included a pamphlet that showed several additional flat patterns and 3D shapes that can be made with this set. Our son has created his own shapes also, like his version of a train. We like that he is using his imagination to create things. He knows his basic shapes and now he’s learning how the shapes fit together. We have been very happy with this set. 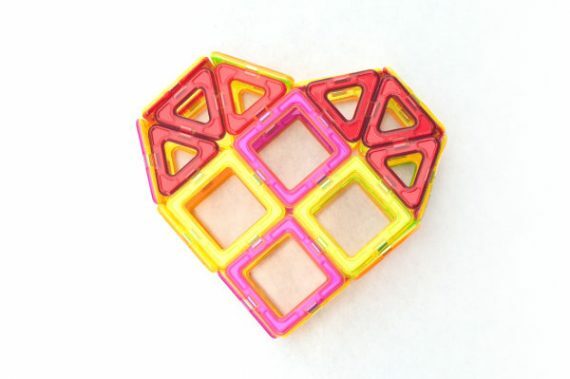 If you are looking for a fun magnet tile set for your child, you should be pleased with this set. So I was looking for a toy that would keep my grandsons little two year old mind and hands busy. Hoping I didn’t pick another throw away or sit at the bottom of a toy box toy. It’s kinda hard when you don’t get to see the child in action all the time. He lives 3000 mile away, most people would think a magnet building set would be too much for a two yr old, but it wasn’t. It was a total hit! After his present opening part of the party he was building with it. Maybe it wasn’t what it was supposed to be but its what he created. His mind and hands where busy creating his very own 2 yr old master pieces. I’m sure that once he figures out it stick to metal things, there will be some interesting things built off the fridge lol. Thanks for creating a toy even I want to play with ;)! My two boys received a box of 98 magical magnets for Christmas. These magnets have been a wonderful source of enjoyment and creative processing for hours on end. This 40 piece set is a great addition. Upon receiving the package, I discovered that with every toy you buy from A Mustard Seed they donate a toy. Wonderful. Even better. We received this item on time and in excellent condition. This was purchased for 2 1/2 year old twins. While they enjoyed the colors and the concepts, they really enjoyed all the fun things the adults were helping them make with all the parts. Fun for kiddos, parents and grandparents! I hardly ever leave reviews… However, I have 3 year old twins who spend a lot of time building with these magnetic shapes. Am happy they are more reasonably priced and compatible with their earlier set. The wheels and designs are priceless. Highly recommended! The kids love them and they are just as good as the popular name brand. They don’t know the difference but our bank account does. It’s a very clever choice, I have two kids 3 years old and 9 years old both of them could play on their own way. They made countless shapes and figures as how they imagined!! I totally recommend this product and even I wish if I bought the product with more pieces so they can have fun with their friends. Packing was nice and quality is good. 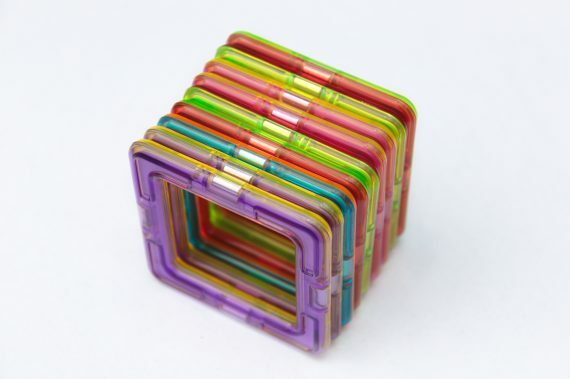 This building set is a colorful well constructed set of magnetic shapes that my two Grandchildren, age 6 and 4, have had a great time playing with. The set comes with an easy to follow instruction book that allows my Grandchildren to put together many different items. This set is one of first toys they look for when visiting our home. I purchased this toy for my grandson and it has been a gift well received. He has loved playing with and making things with these magnetic tiles. All those playing with him have had so much fun…it has been a joy to watch him and his friends. My kids (ages 3 and 5) have played with a few magnetic tile sets over the past couple of years and like this one the most. They really enjoy making cars and using their creativity to build random towers and objects. Will make a great present for friends birthdays too. Great toy!! We gave this set to my nephew for his 6th birthday. My 3.5 year old son was begging his cousin to open up the box and they played together nicely. The next day I saw my nephew using the instruction booklet to build something. 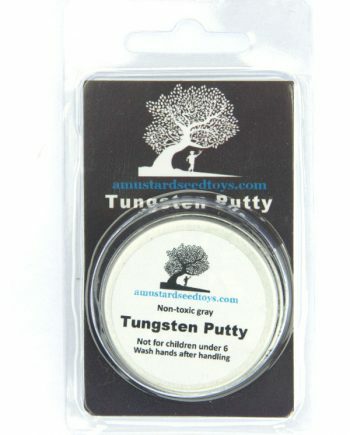 Overall a great product at a good price. These are the GREATEST – I have bought for a few of my younger grandchildren I’m sure my older grandchildren would have fun playing with maybe not to excited to get as a gift. Maybe the large set as a family gift. My son is 3 yearsold and really likes this set. He received a different set for Christmas so he had to warm up to these but now he is building lots of things with them! Ordered this for my Grandson’s 4th birthday. He loves it. His 9 year old brother had so much fun building with him that I ordered another set. This toy is great for creative development. My daughter really like this product. It’s simple magnetic parts allowed her to build and create so many different structures. We’e enjoyed it so much we or even purchased a set as a gift. Given to my grandson at his 5th birthday party. Big hit! All the kids clamored around to check this product out. Thanks for helping me be a success. Love them! They are just as good as Magformers for half the price! My 4 year old loves them. We want more sets with additional shapes! Grandkid loved it- for hours of fun trying new shapes. The box was not too big and easy to wrap. Best toy ever, my four year old keeps these tiles in a special place for easy access. We will definitely be buying more! I gave the magnetic tile set to three families of grandchildren and they all said they love it! Looks like a fun gift but won’t be opened until Christmas so hard to really leave a review right now. Was a birthday present for my 4 year old niece. Said she loves them so guess that’s a good thing. Almost 4 year old loves it. She will need more pieces soon. My grandkids love these. Have several sets and they build and use their imagination. Excellent toy! My 5, 7, and 9 year old play with it. My 4 year old grandson was super delighted with this set given as s birthday present. His creativity was amazing! This is a wonderful toy, lot of fun for kids and adults to play together. Got it as a gift for a friend and they love it! Grand kids loved this item. Seller was great. No problems! My 6 and 7yr old loved it!! On time and grandkids love em. Excellent toy – my grandsons love it. I ordered this for my nephew’s little boy. He received it, and he and his brothers could not stop playing with it. They now want to order a bigger set. I would recommend this toy for all children. I think it really sparks creativity. Not only can they make the things pictures, but can arrange to make other items. A fun toy!! I went on your website to order some more of these for friends of mine, but could not find it. Please advise on what to do. My nephew loved the product. Thank you. 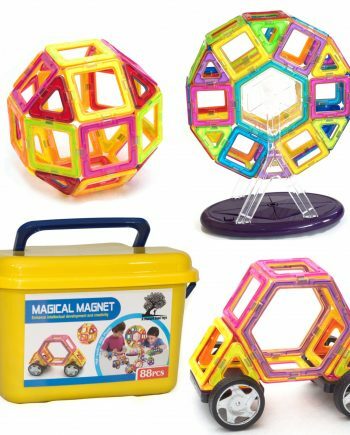 I bought the Magnetic Tile Building Set, Educational Toys with Multiple Colors, Shapes, and Wheels, 40 piece kit for my daughter who is turning six soon. She is a “tinkerer,” she loves to build, create, destroy, and repeat. These are perfect for that. When you build with these, you can build the object flat on the ground, then grab it in the middle, and slowly lift it up. As you lift it, the tiles stick together and your creation begins to take form. She likes to create her own shapes and name them, her “baseball” looks more like a football, but hey, it’s her creation, what can I say, it’s the act of creating that I enjoy. This kit has some large hexagon shapes, but she really isn’t into those for some reason. She enjoys playing with the squares and triangles the most. 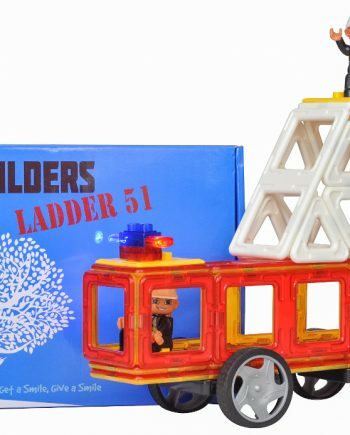 This toy has the added benefit of being educational and fun at the same time. She works in 2-D and 3-D working from squares into cubes, and triangles into pyramids etc. Overall, I am extremely happy with this purchase; my daughter has been playing with this toy for hours at a time since I gave it to her. I may have to buy another set so she has more than 40 pieces to work with. I will be attaching pictures of my daughter’s “baseball” and house she constructed. I received this product at a discount I exchange for my honest and unbiased opinion. If your son or daughter likes to put things together (or take them apart) and build, than do yourself a favor and get a set of these tiles! I can not tell you how incredibly fascinated my son is with this magnetic tiles, at not even two years old yet they keep him entertained for a pretty decent amount of time. Whether it’s trying to create with them or just stacking them and shaking to see if they all stay together. Not to mention my father-in-law who comes over to play with him gets pretty mesmerized by them as well, it’s funny to see a 60 year old man and a 2 year old toddler ‘fighting’ over who’s going to play with which tiles… I do wish there was more color variety with the set that I got, they were all pink, purple and yellow. But it came with 32 tiles in three different shapes to build with, two car pieces (those were a big hit!) and some inserts that i’m actually not sure what to do with… but all in all a terrific set that I highly recommend to anyone! I received this product at a discount in exchange for my honest and unbiased review. These toys are VERY well made and so much fun! I received this product at a discount in exchange for my honest review and I am SO very happy I decided to buy them. They are just great. I have a daycare in my home and ALL of the kids love these. The toddler all the way up to well – I enjoy them too – so up to adults! The kids made some really cool things and it was neat to get to teach them about N and S poles of a magnet. They will NOT snap together if you have the wrong poles trying to connect (trial and error). The first thing my niece built was a “bus” as she explained (photographed below). There are just endless possibilities with these toys and I actually plan to buy the expansions because this set of toys was a HUGE hit with the kids. LOVE LOVE LOVE! We have not had ANY break but many have been stepped on – so they are pretty durable, too. If you happen to be looking for a very unique and creative set of toys that your children or grandchildren will LOVE…then this is it! My three kids (ages 7, 6 & 4) have already spend HOURS playing & playing & creating neat new things with these Magnetic Tile Building Blocks! 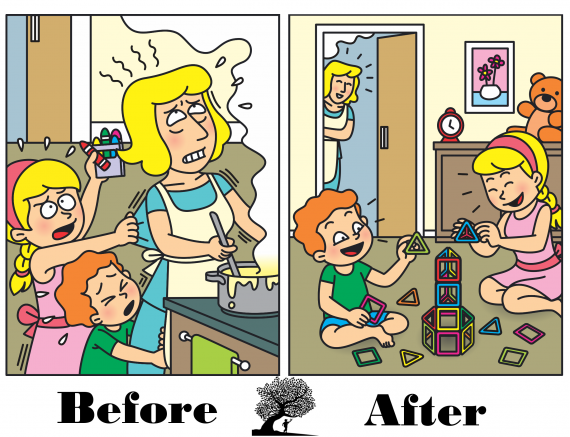 It is so very healthy for growing children to learn to build and create things for brain development. I am impressed with the cheerful, brightness of the block colors compared to how they appear in the product picture! The magnets are amazingly strong and very sturdy! You can build creations directly on the fridge or any magnetic metal surface, and the kids love the extra dimension that gives to their building since it adds to the magnetic grip and fun! I even enjoy playing with them alongside my kids, which makes it even more special to have Mom playing too! My only gripe with this set is that the instruction booklet that is included has many ideas that are not possible to build with just this 40 piece set. The ideas booklet shows several neat creations to build that require a long triangle shape piece that is not included in this box, thus it causes my kids to be very frustrated not being able to build all the fun suggestions. All in all, this set is terrific and I can already tell that my kids will be logging many more hours of playing, creating and designing with this fun set of Magical Magnet Tiles Set! I purchased this set of 40 pieces from A Mustard Seed Toys at a discount in exchange for my honest and unbiased review. 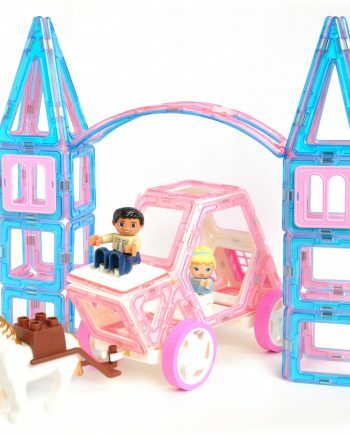 This magnetic building set is so wonderful and fun for the entire family. I got these for my 11 year old autistic son to play with but I have caught my teenage son and hubby playing with them too. They are building cars, trucks, castles, rockets, etc. with them. If you can imagine it, you can probably build it with these. I like that each tile has two different colors on them…one on the front and one on the back. The tiles are lightweight and durable. The opening for each tile is enough that even little fingers can grip them and play with them. I like that there are no sharp edges so even the grandbabies can play with them too. I received a free or discounted product. I was NOT obligated at all to do this unbiased review. The kids have had fun exploring these Magical Magnet blocks since they came in. 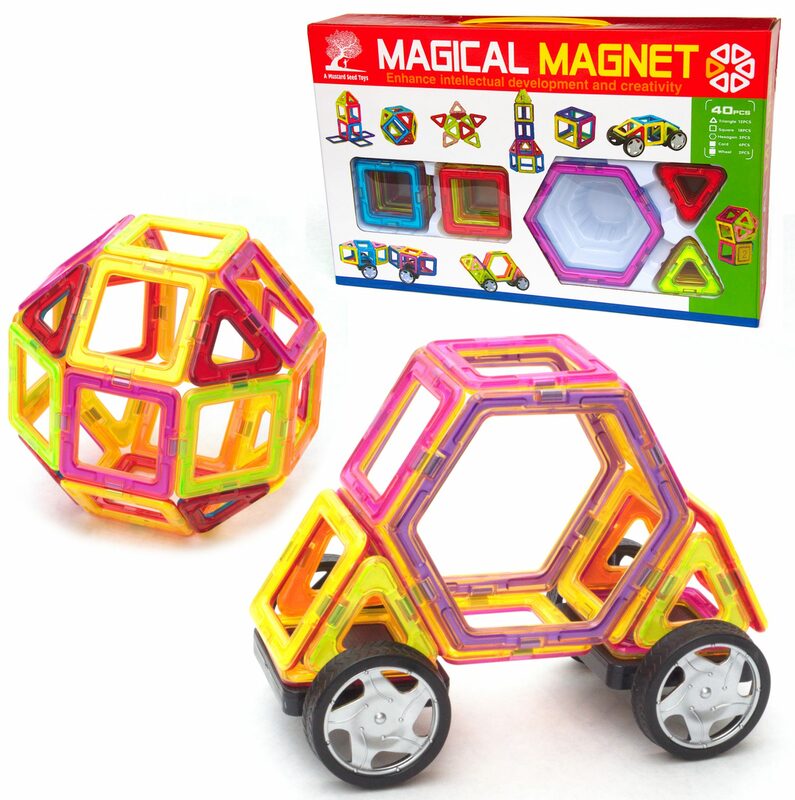 There are 40 pieces in the set from wheel sets, squares, triangles, larger shapes, smaller non magnetic squares that fit into the larger magnetic squares, and cards that fit into the smaller squares. The kids have built cars, houses, and random other things with these. These are fun for kids of all ages. They are sturdy and hold together while building quite well although a swift hand from a three year old can send most structures crashing to the table. They are great in promoting imagination and engineering skills as well as just all out fun to play with. 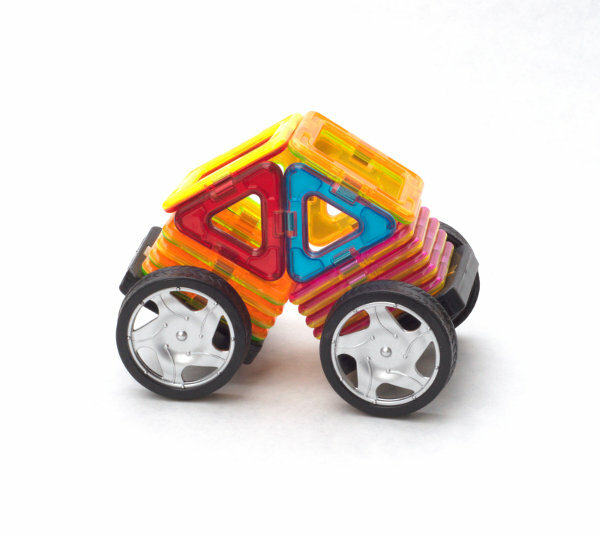 The different shapes are smooth and clear but solid made while the wheels are a solid square base with the tires going through the middle and roll very well. We received these for review but all opinions are our own. Slow to review because I had to wait for a birthday. My grandson (now 5) opened the box and began to build with no instruction. His sister (7) opened the book and began to show him what he could build but his remark was “I can’t red yet”. His daddy and I enjoyed the set also. Wish I had bough the even bigger set and am glad I did not get the 30 piece set. Definitely a learning toy for my young grandson’s birthday. His Mom recommended the toy. She is a teacher and this kid gets many learning oriented toys. This one seems great. This was a birthday gift for my Grandson who just turned four. He loved it but had a hard time getting it back from his six year old sister and his nine year old cousin. Purchased this for my 5 year old nephew and he loves it, also his 13 year old brother also enjoyed playing with it. It just all went perfect. Birthday present for my daughter. My nephew couldnt wait to open it at her birthday party. Begged for an hour. Finally, he opened it and within 5 minutes was bored after building one car. My daughter has not yet played with it. Im sure she’ll spend more time with it as shd has similar magnets at school and really likes them, hence the reason we bought this kit. As far as the kit goes, it seems sturdy and well made. I would price it at $25 as the most Id want to pay for it. I will update once my daughter spends some time with it. My daughter and I played with this 3 days after my first review. The wheels are unimpressive and sifficult to use. My daufhter was frustrated cause you cant build upon them easily. The axis (flat middle part) is not stationary so it flops sll over when trying to build upon it. So it was hard to make a car out of it. She was done playing in about 10 minutes. Needless to say Im disappointed that it hasnt held a kids attention more than 10 minutes. You want a toy, especially one thats educational, to hold their attention at least a half hour. Not sure if we will keep it? Gift for my 3 yr old grandson. Kept him entertained for over an hr. He loves it. Easy for the younger children to build things by themselves. Kinda cheap, definitely not as good as the Mag formers brand. Great toys for the kids. They love them. Price was good. & quality is top notch. Fantastic colors, great quality, travels well: my 3yo loves to play with them, BONUS: they don’t stab you in the foot if you accidentally step on it in the dark! The downside? I want many more!